I want more runes items! You may have already picked up your copy of Storm King’s Thunder at your local friendly game store. Those who did may have found one of the first pictures in the book is of twenty different giant runes. I was excited when I first saw it because these runes must be tied to the rune magic we had heard so much about. Turns out rune magic is very cool. Essentially you find a magic item with a particular giant rune on it and that item gives the wielder several benefits. You can also moves the rune from the item and apply it to a place or object that gets a new benefit. There’s only one problem. Of the twenty runes pictured at the start of the book, only eight are given magic items (or nine if you count the blod stone but I’m not for these purposes since it functions differently than the other rune items). What’s a DM to do? Well make the other 12 into magic items of course! Below is my take on the other 12 runes in magic item form. This femur of a dwarf is petrified to the point of being stone. The uven (enemy) rune is carved out and filled with silver on its top. The bone has the following properties, which only work while it is on your person. After Him. When an enemy within 5 feet of you takes the Disengage action, you can move half your speed as a reaction. Know Thy Enemy. As a bonus action, pick one enemy within 30 feet of you. You learn the enemies’s AC, hit points, and any damage immunities, resistances, or vulnerabilities. Once you use this property, you can’t use it again until you finish a short or long rest. No Escape. You have advantage on opportunity attacks. Weapon. The weapon is now an uncommon magic weapon that requires attunement. When a creature hits you with an attack and deals damage, you have advantage on attack rolls made against that creature using this weapon until the end of your next turn. Armor. The armor is now an uncommon magic item that requires attunement. When a creature hits you with an attack and deals damage and you are wearing the armor, you have resistance against damage from all other attacks made by that creature until the end of your next turn. This curving birch branch is 2 feet long and three inches thick. Small buds make it seem as if leaves could spring out of the branch at any second. The liv (life) rune is burned into the side of the branch. The branch has the following properties, which only work while it is on your person. Healing Grace. Whenever you cast a spell of 1st level or higher to restore hit points to a creature, the creature regains 1 additional hit point. Remove Harmful Condition. As an action, you touch one willing creature and immediately end any blinded, deafened, poisoned, paralyzed, or stunned condition afflicting it. You can also use this ability to remove one level of exhaustion from a creature. Once you use this property, you can’t use it again until you finish a short or long rest. Spare the Dying. As an action you can cast the spare the dying. Gift of Life. You can transfer the branch’s magic to the corpse of a creature that has been dead has been dead for no more than 200 years, that didn’t die of old age, and that isn’t undead by tracing the uven rune on it with your finger. The transfer takes 8 hours of work that requires the branch to be within 5 feet of you. If the creature’s soul is free and willing, the target returns to life with all its hit points. This process neutralizes all poisons, cures all diseases, and removes all curses afflicting the creature when it died. This process closes all wounds and restores any missing body parts. At the end of the transfer, the branch is destroyed, and the creature has a black tattoo of the rune appear somewhere on its body. This diamond is a three-inch-radius sphere cut so the light within it dazzles. Close inspection reveals the light burning within is in the shape of a stig (light) rune. The diamond has the following properties, which only work while it is on your person. Beacon of Hope. As an action you can cast beacon of hope. Once you use this property, you can’t use it again until you finish a short or long rest. Blinding Burst. As an action, your body erupts with radiant light in a 30-foot radius. All creatures in the area must succeed on a DC 17 Constitution saving throw or be blinded for 1 minute. A creature blinded in this way can repeat this saving throw at the end of its turn, ending the blinded condition on a success. Once you use this property, you can’t use it again until you finish a short or long rest. Radiant Friend. You have resistance to radiant damage. Shed Light. As an action the diamond sheds bright light in a 60-foot radius and dim light for an additional 60. You can use another action to make the bright light go down to a 5-foot radius and dim light for an additional 5. Weapon. The weapon is now an uncommon magic weapon. It deals an extra 1d6 radiant damage to any target it hits. Torch. The torch is now an uncommon magic item that requires attunement. This torch never burns out. As an action you can cause the torch to ignite, causing it shed bright light in a 20-foot radius and dim light for an additional 20. You can use another action to extinguish the flame. While the flame is lit and you hold the torch, all creatures you choose within 20 feet of you have advantage on saving throws againsted being charmed or frightened. This emerald is cut into a rhomboid shape, three inches on each side and three inches thick. A gold kong (king) rune is clearly seen within its core. The emerald has the following properties, which only work while it is on your person. Inspiring Leadership. As an action you can speak a magic word of inspiration to one creature you can see within 30 feet of you. That creature has advantage on attack rolls and saving throws against being frightened until the end of your next turn. Once you use this property twice, you can’t use it again until you finish a short or long rest. Natural Leader. You have advantage on Charisma (Intimidation) and (Persuasion) ability checks made to influence creatures of the same type as you. Ruler’s Command. At the start of your turn, one creature of your choice within 5 feet of you can take the Help action as a reaction. Once you use this property twice, you can’t use it again until you finish a short or long rest. Crown. The crown is now a rare magic item that requires attunement. While you wear it, you have advantage on all Charisma (Persuasion) checks. Ring. The ring is now a rare magic item that requires attunement. While you wear it you can speak, read, and write any language and communicate telepathically with any creature that understands a language within 30 feet. This sky blue folding hand fan is rather dainty for a giant, but almost three times the size what a human would normally use. When unfolded, a white skye (cloud) rune can be seen in the middle of the fan. The fan has the following properties, which only work while it is on your person. Cloud Carpet. You can spend 1 minute creating a 15-foot square of cloud 1 foot thick. The cloud can carry up to 10,000 pounds, can hover, has a fly speed of 60 feet, and moves according to your spoken directions, provided you are within 30 feet. The cloud lasts for 1 hour. Once you use this property, you can’t use it again until you finish a long rest. Fog Cloud. As an action, you can cast fog cloud. Gust of Wind. As an action, you can cast gust of wind. Armor. The armor is now a rare magic item that requires attunement. As a reaction when you are hit by an attack you can turn your entire body into cloud stuff until the end of your next turn. While you are made of cloud stuff you are resistant to all damage. Once you use this property, you can’t use it again until you finish a long rest. Boots/Cloak. The pair of boots or cloak is now a rare magic item that requires attunement. You gain a fly speed equal to your walking speed and can hover while you wear this item. This preserved finger of a frost giant is gray and shriveled. It is 3 feet long and 1 foot thick. The flesh beneath its fingernail is carved with a bloody dod (death) rune. The finger has the following properties, which only work while it is on your person. Animate Dead. As an action, you can cast animate dead. Once you use this property, you can’t use it again until you finish a long rest. Death’s Sacrifice. When you deal damage to a creature and it dies as a result, you gain 10 temporary hit points. Necrotic Friend. You gain resistance to necrotic damage. Respect of the Dead. You have advantage on Charisma ability checks made to influence undead creatures. Gift of Death. You can transfer the finger’s magic to the corpse of a creature that isn’t undead by tracing the dod rune on it with your finger. The transfer takes 8 hours of work that requires the finger to be within 5 feet of you. The target rises as a wraith under you control. You decide what action the wraith will take and where it will move during its next turn, or you can issue a general command, such as to guard a particular chamber or corridor. If you issue no commands, the wraith only defends itself against hostile creatures. Once given an order, the creature continues to follow it until its task is complete. At the end of the transfer, the finger is destroyed, and the wraith has the rune floating somewhere within its incorporeal form. This curved horn comes from a giant ram. It is 3 feet long and capped with a silver mouthpiece. The horn is emblazoned with a blue uvar (storm) rune. The horn has the following properties. Lightning’s Call. As an action you can blow the horn. Up to 8 creatures of your choice within 60 feet who can hear the horn and are holding at least one weapon, each have one weapon they are wielding of their choice covered in crackling lightning for 1 minute. During this time the weapons deal an extra 1d6 lightning damage and are magical. A weapon loses these properties if it is dropped or stowed. Once you use this property, you can’t use it again until you finish a short or long rest. Storm Friend. While the horn is on your person, you are resistant to lightning and thunder damage. Thunderous Blast. As an action, you can blow a 60-foot cone of thunder from the horn. Creatures in the area must make a DC 17 Constitution saving throw. Creatures who fail take 22 (5d8) thunder damage and are pushed 10 feet away from you. Creatures who succeed take only half damage and aren’t pushed. Once you use this property, you can’t use it again until you finish a short or long rest. Weapon. The weapon is now a rare magic weapon that requires attunement. It deals an extra 1d6 thunder damage to any target it hits. When you score a critical hit with the weapon, the target must succeed on a DC 17 Strength saving throw or be knocked prone. Boat. The boat is now a rare magic item. Nothing short of total destruction can capsize the vessel. This horseshoe is made from black steel and connected to a chain so it can be worn around the neck. The ferd (journey) rune is emblazoned in green on the item. The horseshoe has the following properties, which only work while it is on your person. Born to Journey. You and up to six other creatures you choose who travel within 60 feet of you can travel for 12 hours a day before having to make a Constitution saving throw against exhaustion. Fleet Feet. Your walking speed increases by 5 feet. Safe Place. You can spend 1 hour creating a permanent teleportation circle on a firm surface without using any material components. Once this circle is created you can spend another hour moving it to a new location on a firm surface of your choice. There can only be one permanent teleportation circle created by this item in existence at a time. When you attune to the item, a previous permanent teleportation circle created by a previously attuned creature disappears. Barding. The barding is now an uncommon magic item. A mount wearing this barding can gallop for up to 8 hours before needing to slow down or be swapped out. Boots. The boots are now a rare magic item that requires attunement. You gain a climbing speed and a swimming speed equal to your walking speed while you wear them. This human skull is gilded. A black hellig (sacred) rune is emblazoned on its top. The skull has the following properties, which only work while it is on your person. Religious Expert. You have advantage on Intelligence (Religion) checks. Reveal Truths. You can cast the following spells without expending any material components (spell save DC 17): augury, detect evil and good, divination, and zone of truth. After casting a spell from the skull, you must complete a long rest before you can cast the same spell from the skull again. Gift of Sacred Ground. You can transfer the skull’s magic to a place by tracing the hellig rune there with your finger. The point where you trace it becomes the center of a spherical area of magic that has a 100-foot radius. The transfer takes 8 hours of work that requires the skull to be within 5 feet of you. At the end, the skull is destroyed, and the whole area is under the effect of a hallow spell (spell save DC 17) that cannot be dispelled by normal means. You choose all of the spell’s variables. This rough-hewn, gray stone is six inches around. It is carved with a deep fjell (mountain) rune. The stone has the following properties, which only work while it is on your person. Create Tunnel. If you spend 1 minute touching a solid surface, at the end of that minute a circular hole opens in the surface that is up to 10 feet in diameter and 100 feet long. Once you use this property, you can’t use it again until you finish a short or long rest. Fists of Stone. You gain a +1 bonus to attack and damage rolls with unarmed attacks. Mountain’s Strength. You have advantage on Strength saving throws. Belt. The belt is now a rare magic item that requires attunement. While you wear it, you can cast stoneskin on yourself as an action requiring no material components and no concentration. Once you use this property, you can’t use it again until you finish a long rest. Goggles. The pari of goggles is now a rare magic item that requires attunement. While you wear the goggles, you can use an action to force one creature that can see you to make a DC 14 Constitution saving throw. If the saving throw fails by 5 or more, the creature is instantly petrified. Otherwise, a creature that fails the save begins to turn to stone and is restrained. The restrained creature must repeat the saving throw at the end of its next turn, becoming petrified on a failure or ending the effect on a success. The petrification lasts until the creature is freed by the greater restoration spell or other magic. Once you use this property, you can’t use it again until you finish a long rest. This preserved pinky toe of a hill giant is shriveled with age. It is 2 feet long and 1 foot thick. A red haug (hill) rune is carved into the bottom of the toe. The toe has the following properties, which only work while it is on your person. Giant Grass. As an action you touch a point on the ground and grass 10 feet tall grows in a 10-foot-square area centered on that point. Creatures in the grass are heavily obscured. Once you use this property, you cannot use it again until you finish a short or long rest. Healing Meal. As an action you can consume a nonmagical, Tiny or smaller object held by you and regain 2d4+4 hit points. The object you consume is destroyed. Once you use this property, you cannot use it again until you finish a long rest. Hurl Earth. As action you can dig up a chunk of dirt from soft earth and hurl it as a weapon with which you are proficient. The earth petrifies mid throw and becomes a rock. The rock deals 1d10 bludgeoning damage and has the thrown (20/60) property. Boots. The pair of boots is now an uncommon magic item that requires attunement. While you wear the boots, you can use your action to stomp on the ground and release a shockwave in a 20-foot radius. Each creature touching the ground in the area (except for you) must succeed on a DC 17 Strength saving throw or be pushed 30 feet into the air and then fall back to the ground and land prone. A creature who fails this saving throw takes 10 (3d6) bludgeoning damage from the fall. Once you use this property, you cannot use it again until you finish a short or long rest. Cloak. The cloak is now an uncommon magic item that requires attunement. While you wear it, you gain a burrowing speed equal to your walking speed. This clear crystal, needle-tipped vial is seems the appropriate size for a Medium or Small creature. The giants who crafted them liked this smaller size because it made the vials easier to conceal. The vial is marked with a red blod (blood) rune. The vial has the following properties. Charm of Blood. As an action you can draw the blood of a creature by touching the empty vial to it. The vial momentarily numbs the area of the body from which the blood is drawn. To do this without being noticed you must make a Dexterity (Sleight of Hand) check opposed by the target’s Wisdom (Perception) check. If you drink all the creature’s blood from the vial as an action within 24 hours of drawing it, that creature must succeed on a DC 17 Wisdom saving throw or it is charmed by you for 4 hours or until you or your companions do anything harmful to it. The charmed creature regards you as a friendly acquaintance. When the effect ends, the creature knows it was charmed by you. Once you use this property, you cannot use it again until you finish a long rest. Impersonate Other. As an action you can draw the blood of a creature who is the same size and type as you by touching the empty vial to it. The vial momentarily numbs the area of the body from which the blood is drawn. To do this without being noticed you must make a Dexterity (Sleight of Hand) check opposed by the target’s Wisdom (Perception) check. If you drink all the creature’s blood from the vial as an action within 24 hours of drawing it, your physical appearance changes to match that of the target’s. All of your equipment and statistics stay the same. This change lasts 6 hours, or until you dismiss it as an action. Once you use this property, you cannot use it again until you finish a long rest. Vial Weapon. You can wield the vial as a melee weapon with which you are proficient. The vial deals 1d4 piercing damage and has the light and finesse properties. When you make an attack and deal damage with the vial you can use your reaction to regain a number of hit points equal to the damage you dealt to the creature. Once you use this property, you cannot use it again until you finish a short or long rest. Diamond. The diamond is now a blod stone (see Storm King’s Thunder Appendix B). The blood of the creature inside the blod stone is the same blood from the same creature that was inside the vial when the transfer took place. If the vial is empty when attempting to transfer the magic to a diamond, the transfer cannot be completed. Weapon. The weapon is now an uncommon magic weapon. When you make an attack and deal damage with the weapon you can use your reaction to regain a number of hit points equal to the damage you dealt to the creature. Once you use this property, you cannot use it again until you finish a short or long rest. 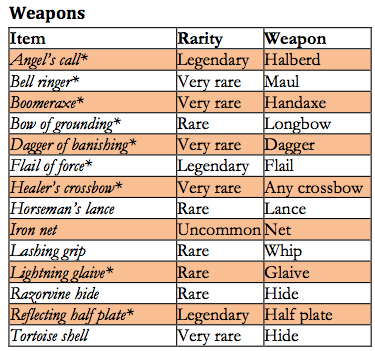 Do you want a PDF of these rune items? Grab them below now or get them anytime over on the Free Game Resources section of this site. Quick note here: WORLD BUILDER BLOG IS NOMINATED FOR AN ENNIE AWARD! You can vote for it right now along with a bunch of other awesome RPG products. The booth closes on July 21st so go vote right now. Good luck to all the awesome nominees. My players are always looking to buy potions. I’m not sure what drives them go into town and ask the local apothecary to list every single item in stock, but it inevitably happens with both of my regular groups whenever they get back to town. Here’s the thing: I let them buy these things. Why? For one thing it seems the default assumption of fifth edition Dungeons and Dragons is that player characters should at least be able to buy healing potions in many places. They are in the Player’s Handbook. 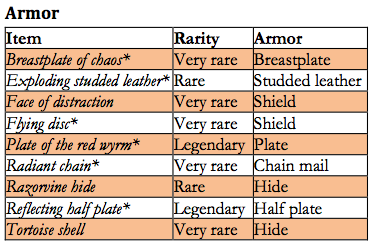 In my own game I’ve taken this further and all (four) common rarity consumable magic items in the Dungeon Master’s Guide are available for sale in most of Exploration Age’s major settlements. (I even allow my players to often buy rarer consumables, but that’s another blog post). 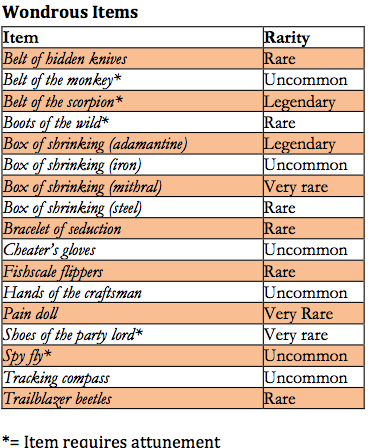 With these points in mind I’m present to you a bunch of new common rarity consumables for your game based on the idea that they should be about as powerful as the potion of climbing or potion of healing (the two common rarity potions in the Dungeon Master’s Guide) and less powerful than the oil of slipperiness, philter of love, potion of animal friendship, potion of greater healing, potion of growth, and potion of resistance (the uncommon rarity potions in the Dungeon Master’s Guide). All the following items are available for purchase at the DM’s discretion and normally cost 50 gp. This murky oil reeks of the sea and can be poured over the body of one Medium or smaller creature. Applying the oil takes 1 minute. Once applied, the creature gains a swimming speed equal to its walking speed for 1 hour. During this time, the creature has advantage on Strength (Athletics) checks made to swim. This oil can be used to coat one melee weapon or up to 5 pieces of ammunition. Applying the oil takes 1 minute. For 1 hour, the coated item has a +1 bonus to damage rolls. The GM chooses this damage type or determines it randomly from the options below. This clear oil reeks of vanilla and can be poured over the body of one Medium or smaller creature. Applying the oil takes 1 minute. Once applied, the creature can phase through one wall or object up to 5 feet thick provided it does so within 1 hour of applying the oil. If the creature ends its turn in an object, it takes 5 (1d10) force damage and is pushed out of the object in a direction of the GMs choosing. Once the creature phases through one object, the oil has no further effect. When you drink this potion, you remove one level of exhaustion for 1 hour. At the end of that hour, your exhaustion level increases by two. This potion is yellow-green and tastes like citrus and sugar. When you drink this potion you gain the effect of the bless spell for 1 minute (no concentration required, only targets you). This potion is a dark blue liquid with floating flecks of gold inside. For 1 minute after drinking it, you gain 10 temporary hit points that last for 1 minute. This brown potion tastes and smells like a hard whiskey. When you drink this potion and are poisoned, you gain a +2 bonus to your Strength score to a maximum of 20. This increase lasts for 1 hour or until the poisoned condition ends, whichever comes first. When the effect wears off, you gain one level of exhaustion. This potion is a pure yellow liquid that tastes like raw eggs. This potion’s container looks half empty (of half full if you’re optimistic) but feels as though it is full of the purple liquid within. When you drink it, roll any die. If you roll an even number, you become invisible above the waist. If you roll an odd number, you become invisible below the waist for 1 hour. Anything you wear or carry on that part of your body is invisible also invisible. While half invisible like this, you have advantage on Dexterity (Stealth) checks made to hide. The effect ends early if you attack or cast a spell. When you drink this potion, your ears turn blue for 1 hour. During this time you have advantage on Wisdom (Perception) checks that rely on hearing. Ear wax sits at the bottom of this light blue liquid that tastes like mud. When you drink this potion, your eyes turn orange for 1 hour. During this time you have advantage on Wisdom (Perception) checks that rely on sight. Eye lashes float in this orange liquid that tastes like salty water. When you drink this potion, your nose turns green for 1 hour. During this time you have advantage on Wisdom (Perception) and (Survival) checks that rely on smell. Nose hairs float in this thick, green liquid that tastes like mucus. When you drink this potion, you have advantage on Charisma (Deception) checks made to tell lies for the next hour. During this time you cannot speak or write any truths. This black liquid tastes like anise. When you drink this potion, you gain resistance to one type of damage for 1 minute. The GM chooses the type or determines it randomly from the options below. When you drink this potion, you have advantage on the next ranged weapon attack you make as long as it is made within 1 minute of drinking the potion. The liquid in this vial is clear and tastes like peppermint and ginger. When you drink this potion, you do not need to eat or drink water for 48 hours. A floating bean sits inside a thick, green mush. These are fun potions, but you (probably) don’t want your level 17 party with tons of gold to buy an unlimited supply of potions of keen ears and never fail a Wisdom (Perception) check again. As a rule I roll a d10 for each type of potion available and that’s all the store has in stock when the characters come to visit. Want this potions in a handy PDF? It’s below! All of these items live on the Free Game Resources section of this site, so come grab them anytime! If you like what you’re reading, please check out my podcasts, follow me on Twitter, tell your friends and share this blog post, and/or leave me a comment and let me know you think. Thanks! New DMs Guild Product – 50 New Magic Items! Sorry for the late post! 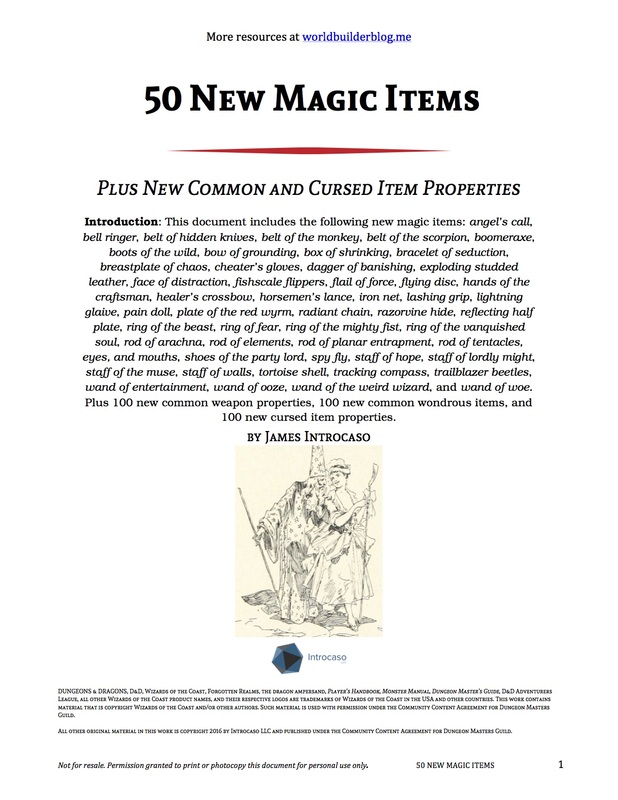 I have been hard at work formatting my latest DMs Guild creation – 50 New Magic Items. Many of these magic items were first published here on the blog. I’ve edited and updated them, reformatted them to make them extra pretty, and thrown in a few pieces of public domain art. Check out the offerings! Plus there’s 100 new common weapon properties, 100 new common wondrous items, and 100 new cursed item properties! It’s all in an easy, breezy, beautiful Pay What You Want PDF. While you’re checking it out, feel free to also grab my other Pay What You Want products. Archons, Catastrophic Dragons, and Greater & Elder Elementals all update Dungeons and Dragons monsters of previous edition for fifth edition rules while 15 New Backgrounds gives you a bunch of new backgrounds as the title suggests plus a module for group backgrounds the whole party can share and a handful of new equipment including bombs! Finally 20 New Traps gives you a bunch of new and updated classics to throw at your PCs. Take a look and please feel free to download for free. This is material I pledged when I created would always be available for free and I plan to stick to that promise. I’m always open to feedback, so leave me a comment, start a discussion on a product page, or leave me a review. Honestly at this point in my RPG career a free download with a good review is worth far more to me than cash. This month’s RPG Blog Carnival theme is “Curses! Cursed Items, Spells, and Campaign Stories,” chosen by Johnn Four over at Roleplaying Tips. This is one of my favorite themes yet! On Tuesday I posted my first entry for the carnival and showed off 20 cursed weapon properties that can be added to any magic or mundane weapon. Now I’ve got another 80 curse properties that can be added to various items. Some of the information from Tuesday’s post is repeated here for you convenience, if you’ve already seen that one, skip down to the armor table. When it comes to cursed items, I find it helps to mix the good in with the bad. For instance demon armor on page 165 of the Dungeon Master’s Guide has a lot of beneficial properties, but also has a curse associated with it – the user cannot remove the armor without a remove curse spell after donning it and and suffers penalties against demons in combat. This presents an interesting conundrum for the player. Should the character wear the armor to gain its awesome infernal benefits, but know that whenever its time to doff a 3rd-level spell better be waiting and that combat with demons is extra deadly? Or is it better to wear some normal armor without awesome magic claws and a bonus to AC? I understand wanted to create a purely cursed object with no benefits whatsoever, but once the players get over the shock and surmount the curse, then the item is pretty much done. If the item has some sweet benefits they may keep that bad boy and that makes the game and the item’s story more layered. With that in mind I’ve created a bunch of cursed magic item properties which can be added to any existing magic items (homebrew or published). Of course, if you prefer to have a purely cursed item for your game, go ahead and simply add a cursed property or three to an existing item. How would you like the information above in a handy-dandy PDF? Ok you got it! The links below have just the information above in one document and the cursed item properties along with the other 200+ magic items I’ve designed in another document. These documents will live forever on the Free Game Resources section of this site so if you ever need them again, go there to find them alongside monsters, D&D fifth edition rules modules, backgrounds, spells, adventures, and more. Curses! This month’s RPG Blog Carnival theme is “Curses! Cursed Items, Spells, and Campaign Stories,” chosen by Johnn Four over at Roleplaying Tips. This is one of my favorite themes yet! Recently I designed 100 common magic weapon properties and 100 common wondrous items. These two posts are currently the most popular ever in this blog’s history. Since I love designing cursed items and people seem to love reading about them, I thought for this month’s theme I’d design another 100 magic item properties – this time it’s all about curses. This post includes the first 20 properties, which can be added to weapons. When giving a magic item (or a non-magical item) to your players, you may choose to add a cursed property to the item. These cursed properties are in addition to any other properties the item may already have. To give an item a cursed property, first determine if the item is a weapon, armor, spellcasting implement, consumable magic item, or non-armor wearable item (such as rings, cloaks, boots, etc.). Then roll or pick a cursed property for the item on the appropriate table. 1 When you score a critical hit with this weapon, it deals 1d12 psychic damage to you. This damage cannot be reduced in any way. 2 After attacking with this weapon for this first time it becomes grafted to one of your hands. While the weapon is grafted to you, you cannot drop or sheathe it and you cannot be disarmed. In addition any ability checks you make which require the use of both hands are made with disadvantage. Only a remove curse spell or similar magic can undo the grafting. 3 When you roll a natural 1 on an attack roll with this weapon, roll the weapon’s damage as if you had hit. Instead of the creature you attacked taking the damage, it heals for the damage amount you rolled. 4 When you roll a natural 1 on an attack roll with this weapon, you become poisoned until the end of your next turn. 5 When you roll a natural 1 on an attack roll with this weapon, you become blinded until the end of your next turn. 6 When you roll a natural 1 on an attack roll with this weapon, you become frightened of the creature you attack until the end of your next turn. 7 When you roll a natural 1 on an attack roll with this weapon, you become incapacitated until the end of your next turn. 8 This weapon only deals half damage to creatures of a certain type (chosen by the DM). 9 You have disadvantage on attack rolls made in sunlight with this weapon. 10 Whenever you miss an attack with this weapon, you fall prone. 11 When you draw this weapon it cannot be put away or dropped until it has damaged a creature. While the weapon is drawn and hasn’t dealt any damage yet, you cannot be disarmed. In addition any ability checks you make which require the use of both hands are made with disadvantage. 12 If you carry any other weapons on your person while you wield this weapon, attacks made with this weapon are made with disadvantage. 13 Each time you draw or pickup this weapon you take 1d6 psychic damage. This damage cannot be reduced in any way. 14 When you use this weapon to attack an enemy while you can see another enemy of a higher challenge rating, you have disadvantage on the attack roll. 15 This weapon cannot reduce a creature to 0 hit points. If a damage roll made with the weapon would normally reduce another creature to 0 hit points, that creature is instead reduced to 1 hit point. 16 When you roll a natural 1 with this weapon, you are charmed by the enemy you attacked until the end of your next turn. The creature you are charmed by is aware of this effect. 17 When you attack a creature with a higher Strength score than you with this weapon, the attack roll has disadvantage. 18 Creatures not native to the Material Plane are drawn to your weapon and wish to claim it for themselves. 19 In a combat encounter when all of your enemies are defeated, if you are carrying this weapon, you must succeed on a DC 15 Wisdom saving throw or see all conscious allies as hostile enemies for one minute. You can repeat this saving throw at the end of your turn, ending the effect on a success. 20 Roll twice on this table. You’ve probably noticed the four other four categories of curses are missing. Stay tuned for those on Thursday! It’s Labor Day weekend here in the US so the blog post is a little shorter than usual as I’m spending time with friends and family. Last week had this blog’s most popular post by far. I created a list of 100 common rarity magic weapon properties which could be applied to any weapon for fifth edition Dungeons and Dragons. Since folks seemed to love that post so much, I’ve created a list of 100 wondrous items of common rarity which can also be used in your D&D games. If you’re interested in the guidelines I used to created these item, check out my post from last week. We need to talk about common magic items. There’s four of them in the Dungeon Master’s Guide – potion of climbing, potion of healing, cantrip spell scroll, and 1st level spell scroll. That’s all! No more! Why even have that distinction if you’re going to have so few items in that category? I suppose I should mention there’s not as few as it seems. Cantrip and 1st level spell scrolls are far more than just two magic items. There’s as many of those bad boys as there are spells of those levels. Still that leaves much to be desired in the common magic item rarity category. Fifth edition Dungeons and Dragons is designed in a way that characters need not be weighed down with magic items as they were in the third and fourth editions of the game. 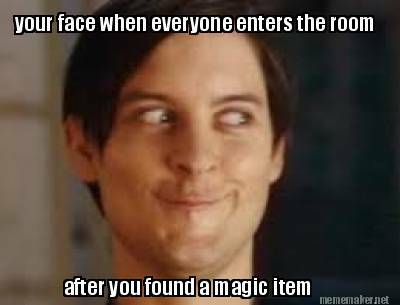 That means getting a magic item is special and by its nature a rare occurrence. So there are no permanent magic items in the common rarity category because if everyone has a +1 longsword then finding one becomes less special and more, “I need this in order for the game to stay balanced.” Even so it can still occasionally be fun to find and give a magic sword, even if it doesn’t give the PC a mechanical boost to attack and damage. There are at least two reasons I can think that a dungeon master might want some permanent common magic items to give out. First is that a DM might just like giving out magic items, but do not want to overpower their party. The second is that they do NOT like giving out magic items, but want their party to be able to face tough beasts like dragons and golems which are usually at least resistant if not immune to nonmagical weapon damage. For this second reason I’m focusing on weapons in this post. Today I’m going to show off some common magic weapon properties I designed which I think fit the bill quite well. Calling potions of healing and 1st level spell scrolls common is a bit of a misnomer. It’s not like every peasant, merchant, or even noble has a pantry full of these items. In most cases they have nada when it comes to magic items. Common rarity is just as much about the item’s power level as it is about its abundance. Now that’s not to say magic items in the same rarity category need to have the exact same level of power. Just look at spell scrolls. Cantrip and 1st level spell scrolls have the same rarity, even though a 1st level spell scroll is by definition more powerful than a cantrip spell scroll. Similarly a +1 shield, a 2nd level spell scroll, a gem of brightness, a headband of intellect, and a sword of vengeance are all uncommon rarity level, but vary in their power level. Still not sold that all items of a given rarity category have different power levels? Consider this – a scroll of fly lets a PC cast fly a single time before becoming worthless. Winged boots let a PC fly for four hours each day without having to maintain concentration and the PC never loses this ability as long as the boots are on foot. Granted the scroll makes a PC’s flying speed 60 feet while the boots use the creature’s normal walking speed, but I’d say even with that fact considered the boots are way more powerful even though both items have an uncommon rarity. So now that we’ve established items of the same rarities can have different power levels, I should point out that items of the same rarity have a similar power level ceiling. Reading through the Dungeon Master’s Guide you can get a feel for what these parameters are. For instance in the uncommon rarity category no weapon or shield gives a bonus greater than +1, no permanent items increase attributes beyond 19, and no magic items duplicate the effects of a spell greater than 3rd level. With all this power level stuff in mind I sat down to determine what weapon properties would common rarity magic items have. Here’s the parameters I gave myself. It is fine for these weapons to surpass the power level of a potion of healing or a 1st level spell scroll in the sense that they are permanent magic items and almost by that fact alone they are more useful than single-use items. These weapons should not have power equal to or greater than a +1 weapon. This means that any bonuses given to attack or damage of these weapons should have their access limited to these boons through circumstances (e.g. bonuses only apply when attacking a specific creature type) or through item recharges (e.g. the property can only be used once per day). These weapons should not duplicate the effects of any spell greater than 1st level. The story of The Wubba Wubba is not my own. In fact I have to give credit to master storyteller R. A. Salvatore for this. The creator of Drizzt Do’Urden, Cadderly Bonaduce, Cattie-Brie Battlehammer, and so many more of fantasy’s greatest always gives this response when asked why he loves games. For those who don’t have the time or patience to watch I’ll sum up (though you should really watch it because it is a fun story told by a master storyteller). R. A. Salvatore had a D&D character who found a modified wand of wonder which had more options and randomness than the original. He kept killing a friend by accident and it was hilarious. He loves those kind of random events in games and that’s why he plays them. I love R. A. Salvatore so I’m going to make my own version of the wand of wonder which he dubbed The Wubba Wubba (because the DM required he yell “Wubba wubba!” whenever he used it). I want to make an updated version of the item which works with the fifth edition Dungeons and Dragons rules. The challenge of making The Wubba Wubba is that rolling on a bunch of different random tables can really slow game play. Yet the new edition of D&D is all about simple, fast results. How does one combine the two and get them to play nice? I thought of a quick solution that generates 1 of 160 results. Roll two different dice together whenever The Wubba Wubba is used. Because the dice are different the person rolling them knows exactly which die pertains to which table, like when rolling attack and damage dice at the same time. You’ll see exactly how it works in the item’s description below. The Wubba Wubba should encourage its wielder to get mischievous. I mean that literally so I made the item intelligent and gave it a provocative personality. Take a look below and let know what you think in the comments! At a glance this wand appears to be a normal wand of wonder but closer investigation reveals the multicolored gems along its length spell out the phrase, “Wubba Wubba,” in Common. The legend of The Wubba Wubba is known far and wide, initially told and spread by epic poet Bob the Bard who wielded one of the wands. Only three were crafted before their creator, Michael the Prankster, disappeared in a planar magic accident. The item is both feared and sought after by scholars, for it is ever unpredictable, but holds great power. While attuned the caster has advantage on all Charisma (Deception) checks and Charisma saving throws. Unlike a normal wand, The Wubba Wubba has unlimited charges. Chaotic Magic. While holding the wand you can use an action to target a creature within 60 feet, shout, “Wubba wubba!” and then roll 1d8 and 1d20 on the tables below. The d8 corresponds to the first table, Schools of Magic, while the d20 corresponds to the table indicated by the first table. The Wubba Wubba uses your spellcasting ability modifier, spell save DC, and spellcasting attack bonus. The Wubba Wubba can only maintain the magic of one concentration spell at a time. 1 Dispel magic cast on target. 2 Protection from energy cast on self. 3 Magic circle cast centered on self. 4 Nondetection cast on self. 5 Banishment cast on target. 6 Freedom of movement cast on self. 7 You gain 20 temporary hit points. 8 You gain a +1 bonus to AC for 1 hour. 9 Shield cast on self. 10 Sanctuary cast on self. 11 You resist bludgeoning, piercing, and slashing damage from nonmagical weapons for 1 minute. 12 High-pitched whistle sound which can be heard for 60 feet follows target making it easy to pinpoint even when invisible or hiding for 1 minute. 13 You resist necrotic and radiant damage for 1 minute. 14 You resist acid, cold, lightning, and fire damage for 1 minute. 15 You resist psychic damage for 1 minute. 16 You resist all damage until the end of your next turn. 17 You are immune to any damage dealt by cantrips for 1 minute. 18 You gain advantage on all saving throws against spells for 1 minute. 19 You gain advantage on all Constitution saving throws for 1 minute. 20 You gain advantage on all Dexterity saving throws for 1 minute. 1 You switch places with the target. 2 Stinking cloud cast centered on target. 3 Sleet storm cast centered on target. 4 Hunger of Hadar cast centered on target. 6 Fog cloud cast centered on target. 7 Evard’s black tentacles cast centered on target. 8 Tidal wave cast centered on target. 9 Conjure woodland beings cast. 10 Conjure minor elementals cast. 12 Cloud of dagger cast centered on target. 13 Web cast centered on target. 14 A swarm of insects hostile to all creatures appears adjacent to the target and attacks for 1 minute. 15 A gelatinous cube hostile to all creatures appears adjacent to the target and attacks 1 minute. 16 You teleport 60 feet in the direction of the target. 17 Grease cast centered on target. 18 A random trinket from trinkets table (Player’s Handbook chapter 5) appears at your feet. 19 You teleport 60 feet away from the target. 1 Comprehend languages cast on self. 2 Detect thoughts cast on target. 3 See invisibility cast on self. 4 Add a d20 bonus to your next attack roll. 5 Add a d12 bonus to your next damage roll. 6 Tongues cast on self. 7 You have advantage on the next saving throw, ability check, or attack roll you make. 8 Target has disadvantage on its next saving throw, ability check, or attack roll you make. 11 Speak with animals cast on self. 12 You learn one of the target’s secrets. 13 You learn one of the target’s fears. 14 You learn the name and location of the target’s best friend. 15 You learn the name and location of target’s most prized material possession. 16 You can turn the next hit against you into a miss. 17 You can turn your next attack roll into a natural 20. 18 Target’s next saving throw is a natural 1. 19 Tongues cast on target. 20 Detect good and evil cast. 1 Charm person cast on target. 2 Command cast on target. 3 Heroism cast on self. 4 Sleep cast centered on target. 5 Tasha’s hideous laughter cast on target. 6 Zone of truth cast centered on target. 7 Hold person cast on target. 8 Suggestion cast on target. 9 Calm emotions cast on target. 10 Confusion cast centered on target. 11 Crown of madness cast on target. 12 Enthrall cast on target. 13 Friends cast on target. 14 Compulsion cast on target. 15 Bless cast on self and two closest creatures. 16 Bane cast on target and two creatures closest to target. 17 You and creatures within 10 feet gain 15 temporary hit points. 18 Dominate person cast on target. 19 Compelled duel cast on target. 20 Your Strength score becomes 24 for 1 minute. 1 Fireball cast centered on target. 2 Fireball cast centered on self. 3 Lightning bolt cast at target. 4 Fire shield cast on self. 5 Cone of cold cast. 6 Shatter cast centered on target. 8 Ice storm cast centered on target. 9 Otiluke’s resilient sphere cast on target. 10 Otiluke’s resilient sphere cast on self. 13 Daylight cast on The Wubba Wubba. 14 Chromatic orb cast at target. 15 Storm sphere cast centered on target. 16 Vitriolic sphere cast centered on target. 17 Erupting earth cast centered on target. 18 Gust of wind cast. 19 Darkness cast on The Wubba Wubba. 20 Melf’s acid arrow cast at target. 1 Blur cast on self. 2 Invisibility cast on self. 3 Mirror image cast on self. 4 Silence cast centered on target. 6 Greater invisibilty cast on self. 7 Hypnotic pattern cast centered on target. 8 Phantasmal force cast on target. 9 Phantasmal killer cast on target. 10 Hallucinatory terrain cast centered on target. 12 Disguise self cast on self. 16 You appear to grow a unicorn horn for 1 hour. 17 Your eyes seem to change color (DM’s choice) for 8 hours. 18 Nystul’s magic aura cast on self. 20 You appear as if you are on fire for 1 hour. 1 Blindness/deafness cast on target. 2 Ray of sickness cast at target. 3 Ray of enfeedblement cast at target. 4 Animate dead cast on closest corpse. 5 Bestow curse cast on target. 6 Feign death cast on self. 7 Blight cast on target. 8 Chill touch cast on target. 9 False life cast on self. 10 Gentle repose cast on closest corpse. 11 2d4 zombies rise from the ground and attack all living creatures. 12 2d4 skeletons rise from the ground and attack all living creatures. 13 The closest vampire suddenly hungers for your blood. 14 1d4 wights rise from the ground and attack all living creatures. 15 Vampiric touch cast on self. 16 You learn the location of the seven closest humanoid corpses. 17 Protective bone armor grows around you, granting you a +2 bonus to AC for 1 hour. 18 Target loses 5 hit points and you gain 5 hit points. 19 You have advantage on all Charisma (Intimidation) checks for 1 hour. 20 A zombie ally rises from the ground and serves you for 1 hour. 1 Blink cast on self. 2 Fly cast on self. 3 Gaseous form cast on self. 4 Haste cast on self. 5 Slow cast on target. 6 Speak with plants cast on self. 7 Water breathing cast on self. 8 Polymorph cast on target. 9 Stoneskin cast on self. 10 Polymorph cast on self. 11 Spider climb cast on self. 12 Alter self cast on self. 13 Jump cast on self. 14 Enlarge/reduce cast on self (reduce only). 15 Enlarge/reduce cast on self (enlarge only). 16 Heat metal cast on closest held metal weapon. 17 Heat metal cast on closest worn metal armor. 18 Your skin turns blue for 1 week. 20 Darkvision cast on self. Sentience. The Wubba Wubba is a sentient chaotic neutral wand with an Intelligence of 16, a Wisdom of 10, and a Charisma of 19. It has hearing and darkvision out to a range of 120 feet. The weapon can speak, read, and understand Common, and can communicate with its wielder telepathically. Its voice is energetic and cartoony. While you are attuned to it, The Wubba Wubba also understands every language you know. Personality. The Wubba Wubba exists to have a great time. It cracks bawdy jokes and then laughs out loud at itself. It encourages its wielder to prank friends, engage in revelry, and above all use the wand’s Chaotic Magic feature as often as possible. If the wielder is a true partier and friend to The Wubba Wubba, the wand will fiercely defend the wielder from any japes or cutting remarks. The Wubba Wubba is quick to judge and if it doesn’t like someone that person will certainly know it, since the wand doesn’t keep its mouth shut. The wand does not suffer bullies of any kind and has no respect for authority. The wand has an irrational fear of spiders. Any size spider within the wand’s sight causes the wand to howl in fear like a small child. In battle with arachnid foes The Wubba Wubba prefers its wielder to keep a healthy distance away but cheers with delight when all enemies are vanquished. Yes, I did indeed make this very special item available as a PDF. You can download just The Wubba Wubba or get it along with 82 other magic items I designed for Exploration Age. You can get it all in the link below or feel free to head on over to the Free Game Resources section of this site to grab it whenever you like along with tons of monsters, D&D fifth edition rules modules, backgrounds, spells, and more. No this post is not about your favorite WB show. This is about one of my favorite sections of the fifth edition Dungeons and Dragons Dungeon Master’s Guide. Charms are a special boon that can be tapped a few times to give a creature a an extra ability before wearing off. Mechanically, they’re like potions that are carried and activated internally. Unlike blessings, charms are not permanent. After a specific number of uses or short period of time they’re used up. Charms are gained by interacting with the magical places, creatures, and items. Specifically in Exploration Age most charms are gained by spending time in a planar overlap zone. Checkout the excerpt from the upcoming Exploration Age Campaign Guide below to see the charms available in my setting. Speaking of charms, do you like these charm bracelets? 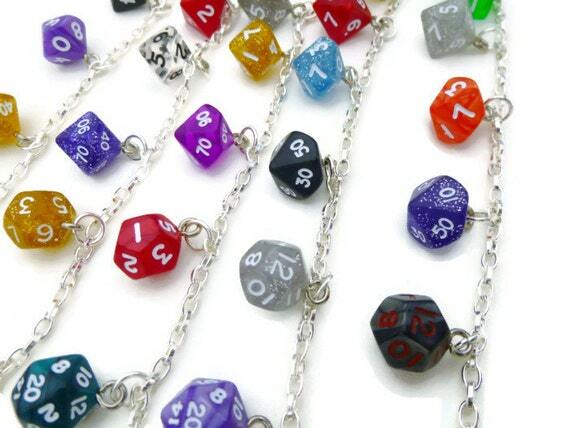 You can buy these and a bunch of other great pieces of jewelry and gaming accessories made of dice from Eclectic Eccentricities by Bella Rose. Any creature native to the Material Plane who takes a long rest in an overlap zone has a chance of gaining a charm at the end of their rest. A creature’s alignment can increase its chance of gaining a charm depending on the overlap zone in which it is resting. Use the table and charm descriptions below when PCs take an extended rest in an overlap zone. Remember any creatures they come across who live in the zone may also have the benefit of a charm. Charm of Animal Conjuring. As an action you can cast conjure animals. Once used 3 times, this charm disappears. Charm of Beast Speech. You can talk to beasts as if you are effected by the speak with animals spell. This effect lasts 9 days and then the charm disappears. Charm of Chaotic Energy. This charm has 3 charges. As an action you can expend 1 charge to cast fireball, lightning bolt, sleet storm, or stinking cloud. Once all the charges are expended, this charm disappears. Charm of Death’s Animation. As an action you can cast animate dead. Once used 3 times, this charm disappears. Charm of Death Speech. As an action you can cast speak with dead. Once used 3 times, this charm disappears. Charm of Deceptive Speech. You have advantage on Charisma (Deception) checks made while lying. This effect lasts 9 days and then the charm disappears. Charm of Disease Removal. As an action you touch a creature suffering from a disease and it is cured of its disease. Once used 3 times, this charm disappears. Charm of Evil Annihilation. When you deal damage to evil-aligned creatures they take an extra 1d6 radiant damage. This charm lasts for 3 days and then disappears. Charm of Extra Attacks. As a bonus action you can make a melee or ranged attack. Once used 10 times, this charm disappears. Charm of Fear. As an action you can cast fear. Once used 3 times, this charm disappears. Charm of Fiery Resistance. You are resistant to fire damage. This charm lasts for 9 days and then disappears. Charm of Fiery Wrath. As an action you can cast the fireball spell. Once used 3 times, this charm disappears. Charm of Flight. As an action you cast flight on yourself. Once used 3 times, this charm disappears. Charm of Good Annihilation. When you deal damage to good-aligned creatures they take an extra 1d6 necrotic damage. This charm lasts for 3 days and then disappears. Charm of Healing. As an action you regain 3d8 + 5 hit points. Once used 3 times, this charm disappears. Charm of Madness Infliction. As an action one creature you see must succeed on a DC 15 Wisdom saving throw or gain a random form of short-term madness. Once used 3 times, this charm disappears. Charm of Meld into Stone. As an action you cast meld into stone on yourself. Once used 3 times, this charm disappears. Charm of Murderous Efficiency. When you drop a chaotic-aligned creature to 0 hit points with a spell or attack you gain 5 temporary hit points. This effect lasts 9 days and then the charm disappears. Charm of Plant Talking. This charm has 6 charges. As an action you can expend charges to cast entangle (2 charges) or speak with plants (3 charges). Once all the charges are expended, this charm disappears. Charm of Radiant Resistance. You are resistant to radiant damage. This charm lasts for 9 days and then disappears. Charm of Reincarnation. The next time you die this charm casts the reincarnate spell on you. Once used, this charm disappears. Charm of Savagery. When you hit with an attack you can use this charm to deal an extra 3d8 damage of the attack’s type. Once used 3 times, this charm disappears. Charm of Slayer’s Healing. Whenever you reduce a creature to 0 hit points, you regain 5 hit points. This charm lasts for 9 days and then disappears. Charm of Slaying. When you score a critical hit you roll all of the attack’s damage dice three times and add them together with any modifiers to calculate damage. After scoring three critical hits with this charm, it disappears. Charm of Victorious Armor. As an action you gain 20 temporary hit points. Once used 3 times, this charm disappears. Charm of Water Breathing. As an action you cast water breathing on yourself. Once used 3 times, this charm disappears. Longtime followers of the blog probably knew this was coming. If you want just the charms to have and hold forever, they’ll live in the link below and on the Free Game Resources section of this site. If you haven’t checked out the offerings there, please do so. Monsters, magic items, mounts, and more await you!